Chewing gum is perhaps one of the oldest candies in the world. There is some evidence of pre-historic people chewing clumps of tree resin or tree sap. Ancient Greeks, Mayans, early American colonialists - were all into some kind of gum chewing. In today's time, most of us chew gum just for the heck of it or simply to sweeten our breath. However, chewing gum does much more than to just freshen breath. Health benefits of the humble chewing gum are multifarious. Below I've listed some uses of chewing gum . Chewing gum, it is said, exercises the facial and jaw muscles and improves the blood circulation in those parts; that’s why many prefer this particular facial exercise to ward off wrinkles. However don't overdo it; just 5-10 minutes of chewing is enough. 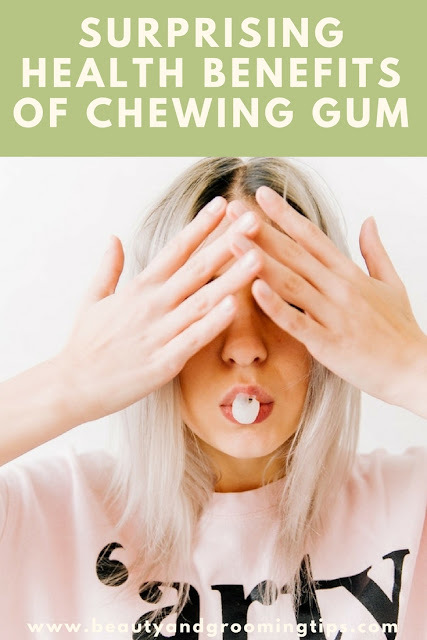 One study has shown that chewing gum stimulates saliva production and increases the salivary flow, which in turn neutralizes teeth-eroding and cavity-causing acid produced by harmful bacteria present in the teeth. One more study from Finland has concluded that there is a considerable reduction in tooth-decay in children who chewed gum with an artificial sweetener called Xylithol. However gums containing sugars and other artificial sweeteners can cause cavities and tooth-decay, especially if you don’t rinse your mouth after chewing. So better use a sugarless gum for chewing. Chewing gum has 2 more oral health benefits. As mentioned earlier, chomping on gum stimulates saliva production enormously, by almost 10% than the resting rate. This in turn helps a lot in combating mouth dryness and other problems associated with it. So if you are suffering from a dry mouth, do try chewing gum to get some relief. It can also get rid of bad breath for the same reason, that is, if your halitosis / bad breath is not due to some other underlying medical problem. For those of you who experience nausea or motion-sickness while travelling, chewing gum can help tremendously. Motion sickness is supposed to be caused by conflicting signals in the inner ear, eyes, and sensory receptors. Both the action of chewing as well as the excess saliva produced will ease the symptoms of nausea and motion sickness while traveling in a car, boat or any other vehicle. Ginger flavored anti-nausea chewing gum like this can help. Also check for more tips and home remedies for motion Sickness while travelling. If you often experience a burning sensation in your stomach or a heart burn (pain in the lower chest area) after your meals or dinner, you have a condition called acid reflux. It happens when stomach acid flows back up into the food pipe. Chewing a gum will trigger the production of saliva and cause frequent swallowing. Consequently the excess acid in the stomach is neutralized and inflammation is reduced, thereby soothing the oesophagus and providing relief from acid reflux. So instead of popping antacids which might prove to risky, try sugar free gum to alleviate acid reflux. A recent study conducted by Andrew Scholey from Swinburne University, Australia has shown that chewing gum can relieve anxiety, improve alertness, reduce stress and lead to improved performance in multi-tasking activities among individuals. Even the U.S. armed forces have been providing troops with caffeinated gum to keep soldiers alert for extended periods of time without experiencing fatigue or drowsiness. This practice was started as early as 1935 (World war-I days) and is continued even today. So whether you are studying for an exam or working late hours to complete a project, consider chewing gum to remain alert instead of continuously sipping cups of coffee / tea and get high on caffeine. Also when you are nervous or stressed, instead of biting nails, which is a bad beauty habit do consider chewing gum. Also read Quit the nail biting habit. If you are getting forgetful these days, it might be wise to try some of these tips to beat memory lapses. Chewing gum can also help improve memory. Certain studies have shown that cognitive function and overall test performance improves when you chew gum. What happens is that the act of chewing speeds up your heart rate and blood flow, increases oxygen delivery to the brain by as much as 40% and wakes up both left-and right hemispheres to get "in-sync", to work together. On that note, did you know that deficiency of vitamin B12 can also lead to memory loss? I read about this tip in a brochure while on a flight. Fluctuating air pressures while flying can cause ear pain or earaches in some people. Yours truly, is one of them. Some suggest to put cotton in the ears or clench the teeth or pinch your nose to ease the pain. Trust me, none of these remedies work. However chewing gum definitely works. The jaw-movement and saliva production that happens when you are chewing gum equalizes the pressure in your ears and assuages ear popping or ear pain. Chewing gum for long hours can also induce a headache as so many muscles in your face and jaw and are at work and keeping this up repeatedly for hours on end can bring on jaw-pain or a headache. Orthodontists say that if your head hurts or if you often experience jaw-muscle fatigue after chewing gum, it is better to stop this habit for sometime at least. Stuck chewing gum? What to do? And by chance if chewing gum gets stuck in your hair or on your shoes, rub hard on it with an ice-cube. It will come off easily in a few minutes. In conclusion, chew gum sensibly and as always moderation is the key; don't overdo it. Also remember to dispose it off responsibly after you are done with it. So what other health benefits of chewing gum have you discovered? Do share in the comments below. Real thanks for giving this useful info. Who would have thought. Chewing gum can actually be beneficial. thank you for sharing nice info. Some of them are increasing your IQ, preventing tooth decay and freshening your breath, it also reduces tension, helps you to concentrate, helps people to quit smoking, and it prevents acid reflux and heartburn. The bad part about gum is that your teeth are constantly breaking in the gum if you chew it for a long period of time. Increases blood flow to the brain which is actually helpful when studying. When you’re stressed out or feeling less than mentally focused, you may just want to pop a piece of gum into your mouth. Over the past few years several scientific studies have all pointed to a very real psychological benefit derived from simply masticating repeatedly. Thanks a lot for posting this article. Its very useful. I had no idea about the good effects of chewing gyms. If it really reduces stress, will surely try next time. I think that post-meal gum chewing is likely health promoting. Most of us simply don’t chew our food as well as we should. This almost certainly affects our digestive potential. Chewing gum can compensate for this sub-par level of mastication. The best endorsement I can give is whether I do something myself and/or would recommend it to my loved ones. I chew xylitol sweetened gum after many meals and I suggest the same to my family. Don't chew a big wad of gum. That can put a strain on the jaw muscles. stop chewing a piece of gum when it becomes hard in your mouth.